Background: Canine parvovirus (CPV) enteritis is an important cause of high morbidity and mortality in pups. The high incidence of parvoviral enteritis is due to high capability of CPV to evolve into more virulent and resistant variants. The condition may be worsening in case of local gastrointestinal and systemic inflammation. In addition to CPV enteritis less common is the cardiac form, which attacks the heart muscles of very young puppies and often leading to death. Therefore, early and confirmed diagnosis of CPV is essential for suitable treatment of infected dogs. 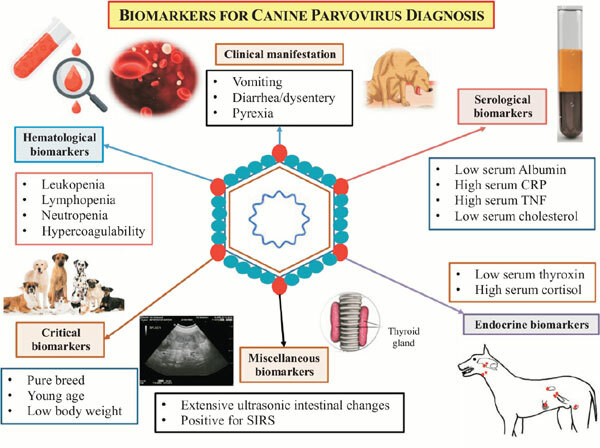 Objective: The prime objective of this review paper is to extend scientific knowledge on CPV as well as cardiac biomarkers in order to efficiently diagnose intestinal and cardiac forms of CPV in dogs. The information would eventually be helpful in proper treatment of suffering dogs falling in different age groups. Methods: The current review is based on extensive information search, analysis and compilation of CPV biomarker data from much authentic published literature available in several scientific databases including PubMed. The information also includes current knowledge of several clinical factors such as biochemical, haematological and endocrine parameters used as diagnostics as well as prognostic biomarkers in CPV enteritis. The review is also supplemented with cardiac biomarkers to assess the heart health in infected dogs where cardiac ailment may occur as consequences of viral enteritis. Results: In this review, we have elaborated current views of some CPV specific biomarkers along with cardiac biomarkers which would improve prognostic efficiency as well as diagnostic accuracy among canine patients. Conclusion: The current review discussed the CPV specific several biomarkers such as season, body weight, breed, lymphopaenia, leukopaenia, thrombocytopaenia, hypercoagulability, hypothyroxinaemia, hypoalbuminaemia, hypocholesterolaemia, hypocitrullinaemia, C-reactive protein level, tumour necrosis factors for assessment of disease condition. The severity and outcome of CPV infection are also dependent on host (breed), pathogen, secondary bacterial and viral infections, stress and environment. Application of biomarkers is based on several prognosticators such as hematology, coagulation abnormalities and serum biochemistry changes that can identify the patients at high risk of death and their targeted management in easier way. Recently, cardiac biomarkers including cardiac troponins and natriuretic peptides are being applied as diagnostic and prognostic biomarkers in dogs. Biomarker, canine parvovirus, diagnosis, endocrine, haematology, troponin.